Regardless of position, all players need to know and will have the opprotunity to carry, pass, and kick ball as well as tackle opposing players. All players are "skill players". Person on the left side. and bring it their team's side of the scrum. Person on the right side. Responsible for keeping the Forwards "locked"
A team can have up to 25 on the team roster. A team can have up to 15 on the team roster. Those coming from American Football may find the following webpage of interest. 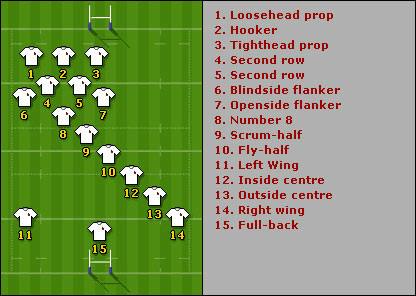 "Rugby Positions for the American Football Player: How Gridiron Skills Can Translate to the Rugby Pitch."